and A4>h and are constants. E is the unit nadir vector. Here, A is the known attitude, and S is determined from an ephemeris and is evaluated at /= ts. Note that this description of horizon sensor biases is valid only for horizon sensors with fixed mounting angles, y.
where is a constant azimuth bias on the horizon sensor mounting angle, and A<bHR is an additional horizon sensor rotation angle bias caused by tH and Ay as shown in Fig. 7-17. All of the above applies also to the Sun-to-Earth-out and Sun-to-Earth-midscan models, where t,, and H, are replaced everywhere by <I>0, ta, and H0 or tm, and Hm, as before. From Fig. 7-17 we see that the geometrical relationship between A/?, and ts is identical with that between A4>„, Ay, and tH. The practical difference is that p can be found directly from Eq. (7-62), whereas y cannot and therefore must be expressed in terms of yN, Ay, and tH. It is the independent knowledge of (3 which makes it possible to eliminate A/? from the expressions for $ and A4>s. Once es is found, A/3 can be computed from /?m, fi, and ts. The expression on the right side of Eq. (7-60) is a complicated function of the following biases: cs, tH, Ay, Ap, and The values of the various coefficients in that expression depend on the numerical values of the attitude A and the time. To determine the above biases, at least five independent equations are necessary, although the numerical solutions of such a system would generally not be unique. Such equations can be obtained by taking measurements at various attitudes and times. When reasonable initial estimates are available, ambiguities can generally be resolved and satisfactory solutions obtained. 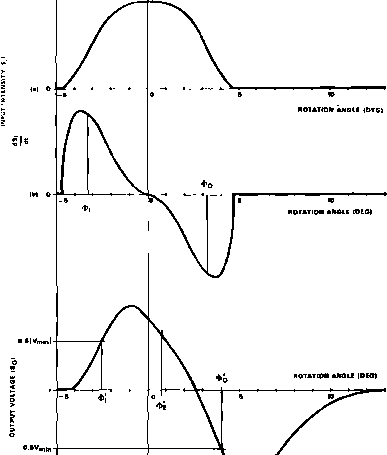 J-co where h(t,tr) is called the impulse response Junction of the system. A system that obeys Eq. (7-66) is called a linear system, because the response of such a system to the linear input combination Sj = Sn + Sn is the output Sa = S01 + S02, where Sol is related to Sn by Eq. (7-66) and, similarly, for SQ2 and Sl2. 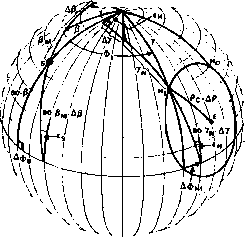 Extensive literature exists on the subject of linear systems. See, for example, Schwarz and Friedland , Kaplan , or Hale . is called a convolution integral [Schwarz and Friedland, 1965; Kaplan, 1962; Hale, 1973; Churchill, 1972]. Comparison with Eq. (7-68) shows that the output signal of a linear, time-invariant system is given by the convolution integral of the input signal and the impulse response function. This property will be used shortly. •This equation means that the function A(/,/") depends only on the difference t-f, and can be written as a function of that single variable. Clearly, the two functions in Eq. (7-67) must be different mathematically, but confusion should not result from using the same symbol for them. All the systems we consider (in particular, that defined by the transfer function of Eq. (7-78)) are causal, and the infinite upper limit of all V integrals can be replaced by /. As an example of the application of sensor electronics modeling, we shall consider the performance of the infrared horizon sensors on the Synchronous Meteorological Satellite-2, SMS-2, launched in February 1975 [Philco-Ford, 1971; Chen and Wertz, 1975]. The input to the sensor electronics system is the intensity of infrared radiation in the 14-16 pm wavelength range falling on the sensor. 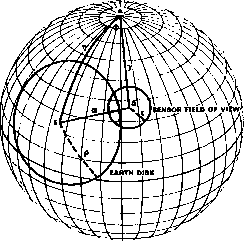 If we assume that the sensor has uniform sensitivity over its field of view and that the Earth is a uniformly bright disk (a good approximation for this wavelength range, as discussed in Section 4.2), then the input signal is proportional to the overlap area on the celestial sphere between the sensor field of view and the Earth disk. Substituting Eqs. (7-75) and (7-76) into Eqs. 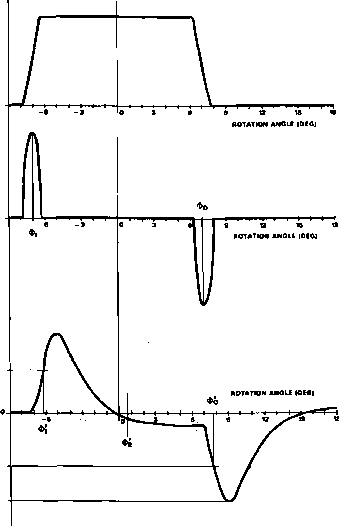 (7-73) and (7-74) gives S, and dS,/dt as functions of the rotation angle, These functions are plotted in Figs. 7-19(a,b) and 7-20(a,b) for ij = 81 deg and ij = 78 deg, respectively, and for y = 86 deg, the mounting angle for the SMS-2 primary Earth sensor [Chen and Wertz, 1975]. 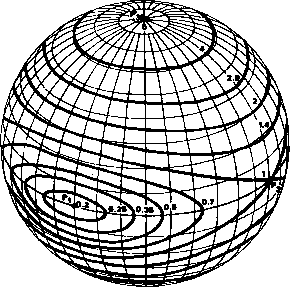 The points where the center of the sensor field of view crosses the edge of the Earth disk are indicated by 9, and 00 on the figures. * A horizon scanner actually makes repeated scans of the Earth, so dS,/df is a rather complicated function. We shall include only one Earth scan in the integral; this is a good approximation if the transfer function is such that the output signal from one Earth scan has decreased to a negligible value before the next scan, as is the case for this example. With this approximation, the integrated part of the integration by parts vanishes at infinite time. The quantity in brackets in Eq. (7-77b) is that integral of the quantity in brackets in Eq. (7-77a) that is finite at a=0. The spin rate, dO/d/, of SMS-2 was taken to be 600 deg/sec which is close to the measured value [Oien and Wertz, 1973]. For this transfer function, the quantity inside the brackets in Eq. (7-77b) can be evaluated in closed form by the method of residues [Churchill, 1972]. The t' integral in Eq. (7-77b) is then evaluated numerically with dS,/dt given by Eqs. (7-74) through (7-76). The output signals, SQ, for ij = 81 deg and 78 deg are plotted in Fig. 7-19(c) and 7-20(c), respectively. They resemble the curves of dS,/dt to some extent, but the peaks are broadened and time delayed, the positive and negative peaks have unequal height, and SQ does not return to zero between the peaks in the cases where dS,/dt does. Thus, the electronics acts something like a differentiating circuit, although its response is quite a bit more difficult to characterize completely.